On the far western edge of the Florida Panhandle, Pensacola is a popular destination for many reasons. White sandy beaches draw snowbirds, intercoastal waters teeming with red snapper and grouper lure in the anglers, and a thriving downtown business district entices foodies and lovers of the arts. If your travel plans have you road tripping Pensacola with kids in tow, you’ll find plenty of indoor and outdoor options to keep everyone happy. 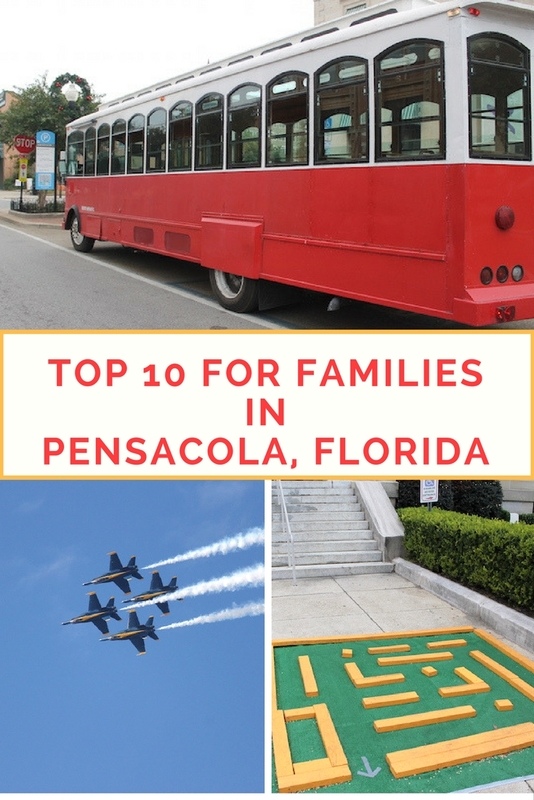 We’ve started with a list of ten, but encourage you to bookmark VisitPensacola.com as it is probably the most comprehensive online resource for regional attractions, news, and events. 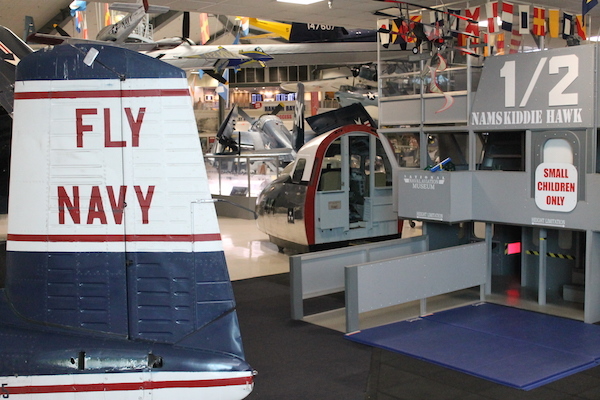 Housing one of the largest collections of historic aircraft in the world, the Naval Aviation Museum features Naval, Marine and Coast Guard aircraft from the dawn of flight to the exploration of space. The Naval Aviation Memorial Theater is the largest IMAX Theater in Florida with showtimes running throughout the day (while admission to the museum is free, there is a per/person charge for the theater). If you have toddlers and young children not interested in the “no touch” exhibits, they will love the Kiddie Hawk play area complete with slides, climbing structure, and mock cockpit. Located on the first floor, the Cubi Bar Cafe is open from 11AM-3PM and is one of a handful of places to enjoy a sit-down meal in the area. Inside the cafe, artifacts and memorabilia serve as an extension of the museum experience. Tip: Before you leave your car, note that backpacks, large purses, or weapons of any kind are not allowed within the facility. Be prepared to have your bags searched before entering the building. Also, make sure and consult the Blue Angel’s flight schedule; leaving time to visit the Museum Flight Line if your visit overlaps a practice date. Located within a short drive from the Naval Aviation Museum, the Pensacola Lighthouse and Museum is a nice option for kids old enough to tolerate a social studies lesson while on a family vacation. 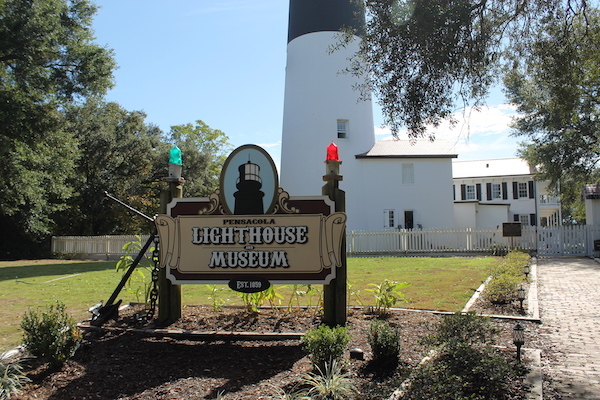 Fully restored to its historical authenticity, the Pensacola Lighthouse and Museum brings visitors back in time to 1859; keepers originally lived in the 150-tower and hauled oil up 177-wraught iron steps to power a 1,000 Watt Fresnel lens that can be seen up to 27 miles on a clear night. Now operated by the United States Coast Guard, the light serves as a navigational aid. A highlight of the visit is a climb to the top of the tower, not recommended for toddlers and individuals with limited mobility. Managed by the National Park Service, Fort Barrancas is the oldest—and arguably most historically significant—site on the Pensacola Naval Air Station. A short drive/walk from both the Naval Aviation Museum and Pensacola Lighthouse and Museum, admission is free to anyone with a National Park Pass (or purchase one at the Visitor Center). 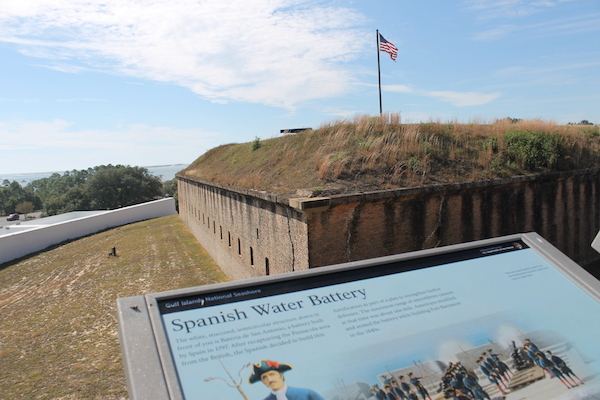 Dating back to the region’s colonization 1600s, visitors to the park experience three historic forts: Fort Barrancas, the Spanish Battery, and the Advanced Redoubt (the fist two which are available for self-exploration; the inside of the Advanced Redoubt is only available through a ranger-led guided program). Leave more time than you think to fully explore the grounds, noting the accurately labeled “steep dark passage” is neither stroller nor wheelchair friendly. Fort Barrancas was a personal highlight of our recent trip to Pensacola; unfortunately, we did not manage a trip to Fort Pickens located on the opposite side of the Pensacola Bay. Geared for children age 10 and younger, the Pensacola Children’s museum presents kids with hands-on opportunities for imaginary play. With a focus on local history, kids can recreate colonial life in Pensacola on the first floor and explore “military, maritime, industrial, multicultural, Native American and Civil War history” on the second floor. The museum is located in the downtown business district and within a short walk of the M.E.S.S. Hall (see the next entry). Both venues are ideal for rainy or chilly days, or a beach break if you need it. 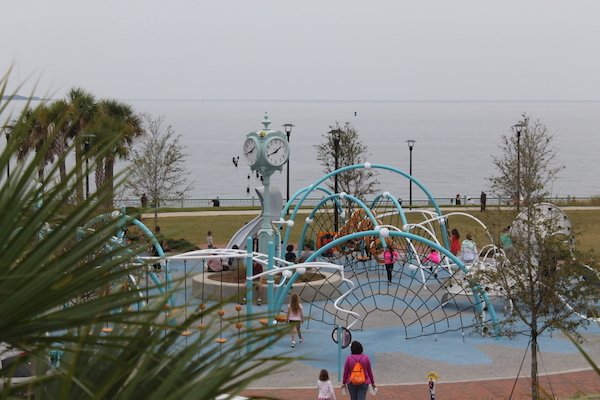 Located near the Pensacola Children’s Museum, the Pensacola M.E.S.S. Hall compliments imaginary play with math, engineering, science, and stuff. Ideal for younger and older kids expect STEM-related exhibits like wind turbines, pendulums, wind tubes, and various forms of energy. If you are visiting Pensacola in the month of November, look for M.E.S.S. Hall’s Science on the Streets exhibits which are scattered throughout the downtown business district. The handful of science-themed exhibits are made possible through one of over twenty arts, culture, and entertainment grants affiliated with Foo Foo Fest and are designed to engage and educate citizens of all ages. If your visit to Pensacola falls between the months of April and August, consider attending one of the city’s minor league baseball team during a home game. Competing in the Southern League, the Pensacola Blue Wahoos call the Bayfront Stadium home turf; Bayfront Stadium is one of many lovely attractions within the Vince J. Whibbs, Sr. Community Maritime Park located along the waterfront. If you’ve attended a minor league baseball game in Pensacola or any other city across the United States, you’ll know the game day experience emphasizes community, entertainment, and good ol’ family values. A multi-use facility, check the Bayfront Stadium box office for year-round events including football, soccer, and festivals. Taken from within Bayfront Stadium, this photo illustrates how close and convenient the Rotary Centennial Playground is for families enjoying a minor league baseball game or a stroll through Vince J. Whibbs, Sr. Community Maritime Park. Let’s face it if you are coming to Pensacola on a vacation, time at the beach should be pretty high up on your bucket list (er, “beach bucket” list). 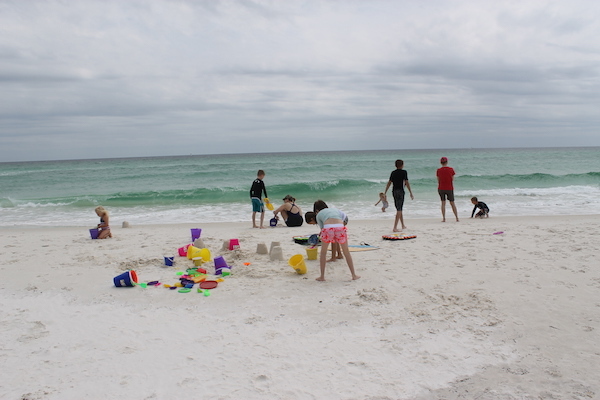 Several options are available when it comes to dipping your toes in the Gulf of Mexico, but we recommend the community of Pensacola Beach for families. Getting to Pensacola Beach involves a short drive across Pensacola Bay and the English Navy Cove (be prepared to pay a toll going one direction, but not the other). Numerous restaurants, shops, and hotels run up and down the barrier island, with designated parking lots with access points for the general public (many have picnic shelters, playgrounds, and water stations for washing off sandy feet). When you go, heed the flag system and select a beach with a lifeguard station (this page is a good resource). This photo was taken a few years ago and in April (the water was a bit chilly, but the kids had a fun time building sand castles and playing in the surf). Stops include known nesting bird sites, sea life on the reef, dolphin viewing points, and seashells and other treasures from the Gulf. Many stops include signs with QR codes that can be scanned with a mobile device to reveal more information. If you’re looking for more ideas on where to take your kids, options include zip lining and canoeing at Adventures Unlimited, go-karting and miniature golf at Fast Eddie’s Fun Center, or water slides and lazy rivers at Sam’s Surf City. In Gulf Breeze, the Gulf Breeze Zoo houses over 800 animals including giraffe feedings, a farm, train rides and a wildlife preserve. For kid-friendly dining, consider Flounder’s Chowder House, which features both a playground and bonfires on the beach. If you are heading towards Gulf Shores or further along Florida’s Northwest Gulf Coast, click on these story links for more ideas. Alternately, if you are visiting during Mardi Gras, read our story from a few years ago.